Beer tasting is one of the best things or events that you can invite a beer lover to! Also, this is one of the most fun things you can organize at your place to bring your friends or family over and enjoy some great brews. Beer tasting is often organized by beer enthusiasts who love to homebrew. This way, they get to advertise their beer for free and boast about their homebrew business, besides having a fun chit chat with their people. Even if you do not brew your own beer at home, you can simply call friends over and have them taste some of the best brews you found in your local breweries. This will just make the whole gathering session a bit more interesting and fun! While many people consider calling a professional for holding a beer tasting session, it can easily be organized on your own. You just have to plan everything ahead of time like what kind of beers to put out for tasting, what order you should follow for the beer tasting, what you should offer to eat with the beer and most importantly, which glasses you should serve the beer in. 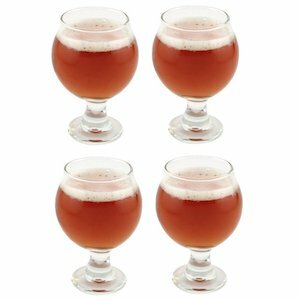 The Libbey Belgian Beer glasses come in the set of four 5 OZ glasses along with a pourer. The pourer is a small spout made of plastic that can easily be placed on a beer bottle for easy and limited pouring. 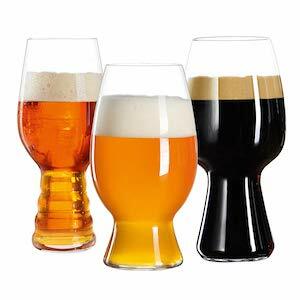 Recognized for their small size, these are the best glasses to serve beer in small quantity; hence these are ideal for tasting. These glasses can also be used for wine tasting. The wide mouth of the glasses lets your nose in so that you can enjoy the aroma of your brew while sipping it. So, they provide enough room for you to taste the beer and tell if you like it or not! These are ideal for tasting Belgian beers, craft beer, or homebrewed beer. The product of the same manufacturer, this one is in a very different shape than the Belgian beer tasting glasses. The shape and size of the glass make it an ideal fit for tasting every type of beer. The glass is available in the size of 5 OZ, and you can choose from different sets of – 4 glasses, 8 glasses, and 12 glasses. 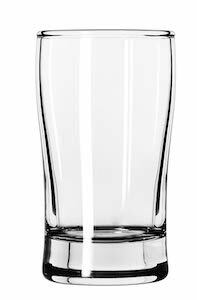 The glass is 4 inches tall and is ideal for all kinds of beer tasting sessions – casual or formal. With the characteristics of a normal pint glass, this one is the best sampler glass for tasting light and dark, both kinds of beers. The shape and design of the glass make it easy for you to hold it, besides its small size. All the glasses from one set can easily be stacked in small stacks. Thus, they are also easy to store. 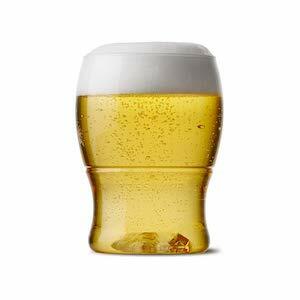 Available in different size variants of 4 OZ, 7 OZ, 12 OZ, and 18 OZ, these glasses are specially designed to enjoy beer. 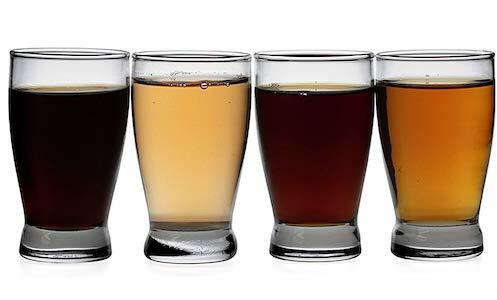 The smaller variants of 4 OZ and 7 OZ are ideal for beer tasting. What sets this beer glass apart is that it is actually made of plastic and is a recyclable product. It is a shatterproof cup that is available in the set of 12 and 48. It is called a pint mini and is clear so that you can see the color of your beer while tasting it. The cups are claimed to be 100% BPA-free and are made of PET polymer of high quality. Their design allows them to stack them and store them in smaller spaces easily. These cups are not dishwasher safe and need to be washed by hand. If you’re planning on buying more tasting cups in a less budget, these are the ones to go! If you’re looking for small yet wide tasting glasses, then the Anchor Hocking Barbary glasses are your best option. These glasses are specially made for beer tasting and hold 5 OZ beer. These are available in the set of 6 glasses, 12 glasses, and 24 glasses. So, you can purchase according to your needs. The glasses have a wide shape and a thick base and are ideal for tasting every type of beer. They are dishwasher safe, so you need not to worry about washing them by hand. The shape and size of these glasses are the best to enjoy the tastes and aromas of different types of beers. So, hold up an amazing beer tasting party and use these glasses to give the best experience to your guests! 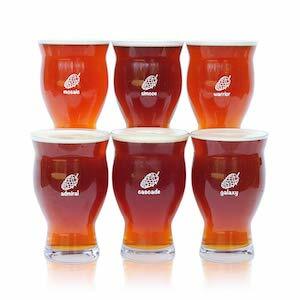 Tulip glasses are well-known to provide the best shape and size for enjoying craft beers. So, if you’re a beer lover, you must be well aware of the magic these glasses do on your brew. The Rastal Teku 3.0 Tulip Craft Beer Glasses are another best option in our list of top beer tasting glasses. Made in Italy, these glasses hold 14 OZ of beer and are made of non-nucleated glass. The curved rim is the best thing about these glasses as it helps keep the head of your beer and lets you enjoy its aromas to the fullest. So, bring home these beautiful beer glasses that are often referred to as ‘the best beer glass in the world’! These are available in a set of 6 glasses at an affordable price. We have talked about the best tasting glasses by far, and next up is a dedicated beer tasting kit! The Spiegelau Craft Beer Tasting Kit is nothing less than a collectibles item for a beer lover. This kit comes with 3 different glasses that have different shapes and sizes. The kit includes a 21 OZ stout glass, a 19 OZ IPA glass, and a 26.5 OZ Witbier glass! So, you can pick any glass according to the type and quantity of beer you’re tasting. 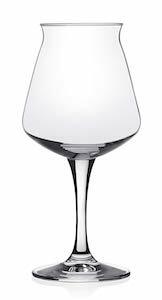 The glasses flaunt German design and are made of high-quality glass. You can get this kit to add to the glassware of your home bar or brewery or can also gift it to any of your friends! 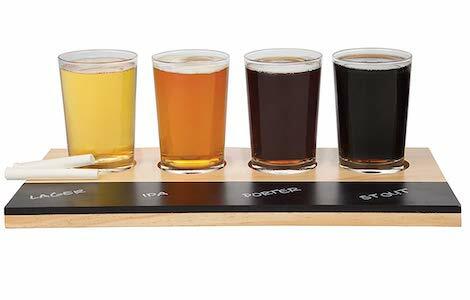 Specially dedicated to beer tasting, this set of sampler glasses are worth a purchase. The set not only has 4 glasses but also has a wooden board that is used as a paddle for placing glasses and chalk to mark on the board which glass has what kind of beer. The board is made of wood and has a chalkboard section. The glasses are dishwasher safe and hold 6 OZ beer. This can also be the perfect gift for someone you know who loves beer. A set of 6 glasses, this beer tasting kit also gives you a great variety of glassware that can be used to taste different types of beers and enjoy them in a designated glass type. The set includes 6 different beer glasses including a classic pilsner, an English pub glass, a Belgian ale glass, a stout glass, a wheat beer glass, and a craft pub glass. All the glasses are of different sizes and give you different options to taste different types of beer. The glass used is lead-free, and the glasses are dishwasher safe. You can buy it for personal use or as a gift for a friend! When you’re planning on throwing a beer tasting party, these are the perfect fit! The six glasses come with individual labels, making them ideal for a party! The labels are named Admiral, Cascade, Mosaic, Galaxy, Warrior, and Simcoe that allow you to remember which glass contains which beer. These glasses are said to be designed by beer scientists. So, they have the perfect design and are etched-nucleated. The design enhances the flavor and aroma of your beer, making them ideal for beer tasting. They are easy to clean and take up less space. 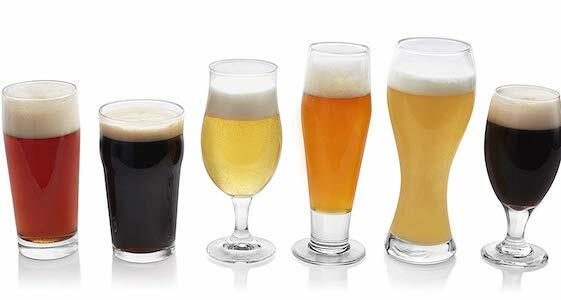 All the options of beer glasses mentioned in this list are an ideal pick for beer tasting. So, if you’re planning a beer tasting party at home and want your friends or family to come and taste your home brews, jazz it up with one of these glass sets. They will give your guests the best experience in beer tasting. So, compare all the options and pick that suits you the best!